We have titled our baby girl's room as "The Bold and the Birdy-ful Nursery" and when you see the pictures that we took of it now that it's decorated; you will understand why. Even though I had plans to steer clear of decorating with any sort of "themed" nursery design and to place the focus on a carefully laid out color scheme, the sight of our bird nursery theme made me smile as soon as I opened the door. I had clearly not avoided the concept of using themes for inspiration as I initially set out to do but it all worked. The bird artwork that I fell in love with trashed my plans and put me on a completely different path, a different one than I had ever thought I would follow. There are those moments in life when you know that changing course is the right move. When I saw the bird prints in a Pier 1 mailer I knew that this was one of those moments and went out the very next day to get them. I saved my receipt just in case I decided against the bird prints. I knew I wanted the wall that the prints and crib are on to "pop," since that they are the first thing you see when you open the door and these prints were just what I needed. During one of our MANY (ha ha) snow days in Dallas this winter I tackled hanging the nursery wallpaper that I found at Bed Bath and Beyond. After the wallpaper was in place, my husband and I combined our efforts and dove head first into our first refinishing project, the dresser we got on Craigslist for $50. The baby's crib can be found for over $200 at Land of Nod but we bought ours on Craigslist for a nice discount at $120. The slim pink dresser and hot pink bench are from Nadeau Furniture. The nursery glider was a floor sample that we bought for half price at Lonestar Baby. I had it recovered for to match the room for $100. I combed the internet for ideas and found a bird cage theme light fixture at Urban Outfitters for $99. I wasn't convinced that either the "look" or the "price" of the light fixture was right so I decided to use some ingenuity and make the light fixture myself. I made the bird coop light fixture myself for $50. I paid $40 for the paper lantern at IKEA and $10 for the birds, branches and chicken wire. Here's a simple tutorial; I just ripped the paper right off the lantern and replaced it with the chicken wire. It was so easy (and cheap) to make and it's one of my favorite things in the baby's nursery! The large art print of the girl came from IKEA and cost $50 and of course, she had to have a pair of her mama's point shoes somewhere in the room. The "L" wall boasts pictures of both of our baby girl's grandmothers when they were little girls, a Bible verse her daddy picked out that I painted on a plaque and a lovely retro piece of Noah's Ark embroidery that a friend gave me as a special gift. Well, that's the end of the Bold and the Birdy-ful nursery tour! I hope that other bird-loving visitors of Unique Baby Gear Ideas have enjoyed our baby girl's nursery pictures and if you have any questions, please free to use the comments section to ask questions. I love the colorful paintings of birds that you did for the wall behind the baby's crib. Is there any chance that you could take and post some pictures of the artwork up close so that we could see the details and colors better? I purchased the bird prints at Pier 1. I have seen them there recently. Did anyone ever find the bird prints? They would be perfect with my nursery! Am looking for a close-up of the 3 bird prints - would like to paint something similar for my daughter's nursery. Thanks! I love this room! I have been searching high and low for a girl nursery that I want to do and I LOVE everything about it. What year did you buy the bird prints from Pier 1. They are not currently in stock but I would like to search for them from other sources. I actually found the drapes on http://store.delias.com/item.do?itemID=55090. They weren't quite the color I was going for, so I bought some dye from a craft store and dyed them dark purple in my washing machine. SUPER EASY I promise! No mess! I love your nursery! Where did you find your drapery? I love the colors and theme, it's vintage and colorful. Love it! Love your nursery, you get my vote! So Proud of the Bold and Birdy-ful Nursery! I love this creative and beautiful nursery! Of course I'm a family member, but this room is so creative and colorful, I believe anyone would enjoy calling it their own! The greatest joy will be walking in and seeing little baby Louisa asleep in her crib in just a few weeks! My vote goes to the Birdy-Ful. Beautiful job. I love all of the color schemes going on in this nursery. It has the soft pastels that are so feminine and when those mix with the bold colors, WOW! Everything seems to just glow, what a way to complement so many fabulous hues. Way to go Lindsi - you have a great eye. And what fun for a baby, so many colors of the rainbow to see! Your nursery puts others to shame! It looks like it should be featured in magazine. louisa will love her new abode! This is creativity at its finest! 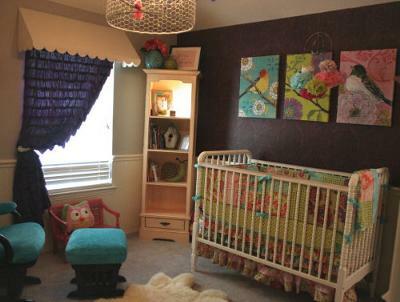 I love the way you mixed it up to form the Bold and Birdy-ful Nursery. Great job! Only thing missing is baby girl. I'm not surprised with the WOW factor of this nursery! Creative genes!! This is the cutest nursery! The colors are wonderful. 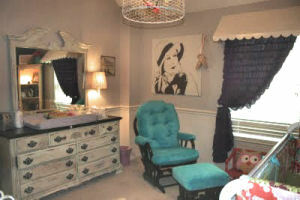 My favorites are the Bird pictures and the light fixture! Love it! Could we possibly have a better shot of the bird cage light fixture? I can't find these prints on Pier 1! Do they have a name? I'm a fan of the soap and of this nursery. I love this nursery. It definitely gets my first place vote! Love the nursery, very unique. Join in and write your own page! It's easy to do. How? Simply click here to return to BIRD NURSERY PICTURES and DECORATING IDEAS.